The V2 Molar Bean Bag™ is a fast and easy way to provide a window mount for a photographer's camera and lens. Designed to fit properly on a car door or window the V2 Molar Bean Bag™ provides superb camera support for any camera and lens combination. The V2 Plate™ is an optional attachment designed for use with the V2 Molar Bean Bag™. You can attach any gimbal or ball head to the V2 Plate™, to provide a very solid platform for your big lens. The Molar TV Bean Bag™ is a travel version of the standard Molar Bean Bag. It is smaller and lighter bag, which still provides stability for large lens. 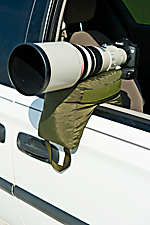 The Big Lens Bag™ is a special bag for big telephoto lens and camera combinations specifically designed to be mounted to a vehicle seat in a vertical position. It is also good for light hiking or moving to a location.